The TallyGenicom 6820 cabinet line printer prints up to 2000 line per minute. The TallyGenicom 6820 cabinet line printer is your choice when reducing noise within your industrial printing environment is an objective. With the 6820 Cabinet, TallyGenicom has designed a modular enclosure that improves reliability and reduces noise emission, making it ideal for office environments. It is the quietest and most versatile choice in our mission-critical line matrix printer series. This industrial-strength printer is ideal for noise-adverse areas running large, unattended print applications. Its genius lies in its design. The TallyGenicom 6820 cabinet line printer was configured to operate in a sturdy, fully enclosed sound-reduction cabinet. 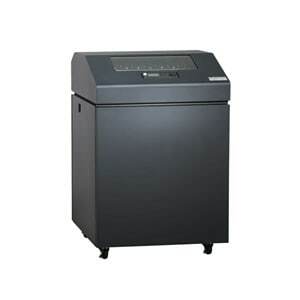 This model features the best innovations from the previous series, which allow users to customize the TallyGenicom 6820 cabinet line printer for specialized printing needs. Like all printers in the 6820 series, the Cabinet is ENERGY STAR® qualified and ready to plug into your network and start printing from day one. Get more printing done in less time. Optional SureStak Power Stacker, which facilitates orderly stacking of hard to handle forms. Optional Rear Slide-Out Paper Drawer with ergonomic features, such as lifting handles that provide the user easier handling and better grip on full box loads. Optional Front Paper Access, which is ideal for supporting operations in confined spaces. Optional Expanded Doors to accommodate larger forms. Our quietest printer for environments where noise is a consideration. Configurations and printing speeds ranging from 500 to 2,000 lines per minute. PowerPrint™ delivers improved print clarity and print darkness on multi-part forms by increasing impact energy. PowerPrint is a standard feature on 6820 printers with a 1,000 line-per- minute print speed. Manageable Savings. The 6820 Cartridge is a smart purchase.